L’échange Tivoli- Shady Side Academy : pas de mur en béton, mais une solide amitié entre les étudiants des deux lycées ! 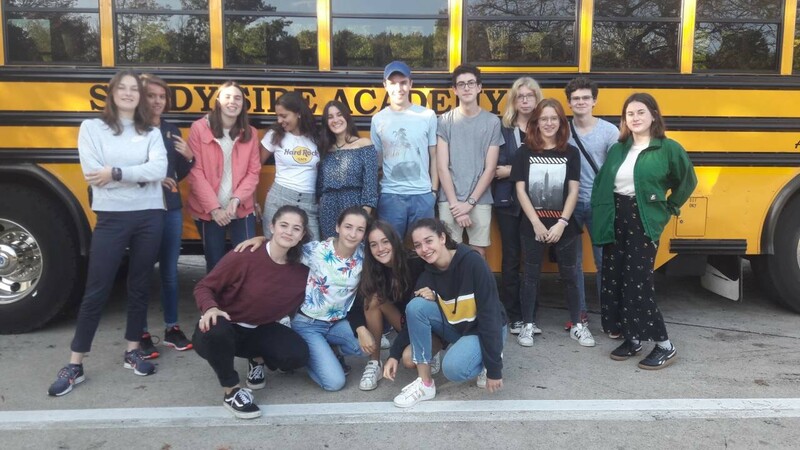 Du 7 au 23 octobre 2018, 11 élèves de 1ère et 4 élèves de Tle ont réalisé leur grand plongeon dans le bouillon de culture américaine, en famille et en immersion dans les cours du lycée de Shady Side Academy, fabuleux établissement privé situé sur les collines de la « Steel City », alias Pittsburgh. La 9° édition de l’échange Tivoli-SSA s’est révélée un franc succès, comme les précédentes, et les 15 élèves sélectionnés pour goûter à la vie d’un(e) Junior ou Senior (équivalent des 1ère & Tle) du lycée américain ont profité de cette belle opportunité pour lier de belles amitiés ! Hébergés en famille et intégrés à la vie du lycée, ils ont ainsi assisté aux cours de leur correspondant, dans toutes les matières. Très sollicités également pour intervenir dans les cours de français « en direct live », ils ont pu partager leur langue et culture avec des jeunes de leur âge. Partage encore et toujours avec les activités sportives d’après les cours « à l’américaine » et les sorties entre copains, dont certaines ciblées « Halloween » en raison de l’approche de la fête très célébrée outre-atlantique comme par exemple la soirée « Fright night » ! !…à donner la chair de poule !! Au programme également, côté culture et découvertes, la visite de la ville de Pittsburgh, du stade de football américain Heinz Field sur les pelouses duquel joue l’équipe mondialement connue, grande star du Super Bowl (« Go Steelers ! »), et du Musée Andy Warhol, avec ses plus célèbres œuvres du mouvement Pop Art. De plus, deux splendides excursions nous ont conduits l’une aux chutes du Niagara…et sa pittoresque balade en bateau –poncho anti-éclaboussures obligatoire !- et l’autre sur les pas de l’histoire américaine avec la visite des monuments de la capitale Washington D.C.
Grand moment mémorable du séjour, la présentation des tivoliens lors de l’Assembly, devant l’ensemble des lycéens et enseignants américains…et en musique…là encore du direct live…mais en anglais cette fois-ci (la vidéo sur youtube est devenue virale depuis !!) des paroles inventées par les tivoliens, chantées sur l’air de « Uptown Funk » de Mark Ronson !…les élèves ont carrément eu droit à une standing ovation…awesome ! « The school was such a good school. First of all, the campus was gargantuan and magnificent. It was uncanny to see this part of greenness in an industrialized city and somehow really delightful. The teachers were captivating and I was happy to go to my classes every day and eager to learn. […] The students were nice, I liked the different interventions such as when a representant of Yale came.” Anna C, 1°S2. « The thing I preferred in this exchange was the contact with American students. Indeed, that allowed me to discover new cultures a new way of life. Moreover, I really liked the campus which is wonderful and so different than the ones we can find in France. » Mathieu G, 1°S1. « Shady Side Academy is an incredible high school, I liked being there, I found the teachers very open-minded, as the students who were also very mature, we could talk about a lot of things, all of this in the middle of a beautiful campus. » Julien L, 1° L/ES. « what I preferred was to go to school with my exchange student. I really enjoyed discovering her classes, the different subjects she studied. I liked trying to understand and doing a chemistry experience with her. It was a real pleasure to be introduced to her group of friends. So, living a school life at Shasy Side Academy was the best experience of this exchange » Sarah R, 1° S3. « This trip was wonderful For me, the best part was our journey in Washington. More precisely the visit of the Capitole because the woman was so interesting I also appreciated the visit of the downtown of Pittsburgh The museum Andy Warhol was also amazing but I was a little bit disappointed when I saw the absence of the famous painting of Marilyn Monroe » Astrid B, 1°S2. « the place that I preferred was Washington DC, visiting all these symbolic monuments of the United States (the most powerful was the wall for the Vietnam War, I think) and obviously, the free time in Georgetown, during which, I could buy many gifts for my family and I could take great pictures of Washington DC by night » Louise J, 1°S2. « We went to Canada, at the frontier, and embarked on a boat, to get closer to the falls. While we got lightly wet because of the wind, we listened informations about the Falls and their history. We had a plastic cloth to protect our clothes, and so we made a unique group picture. » Marc L, Tle S1. « I loved the Carnegie Museum my family took me to visit, it was such an amazing experience, it made me feel so happy and inspired me. Everything was so great! I was very happy to see Vincent Van Gogh’s paintings, because he’s my favorite artist. I also had a great time enjoying the Anastasia Broadway musical at the Pittsburgh theater, and the Tim Burton’s music from movies by the Pittsburgh Symphony Orchestra! It was an amazing trip ! » Myroslava D, Tle L/ES. “The activity I liked most was the trip to Washington DC. I loved going to all the memorials, it is a way to be a witness of all the American history we have been studying in the past years. I loved the visit at the Capitol, our guide was passionate and made the visit spectacular. The Capitol really impressed me by its greatness in size and decoration. All the details in the statues and paintings which are meant to impress and show the power of the United States of America …and it worked with me! […]We did very fun things together, and sometimes with her friends, such as going to fright night, carving pumpkins, going thrift shopping and eating in typical Pittsburgh’s places. I really appreciate going to the American classes to see how different it is from our way to learn. […] Now I just can’t wait for the American students to come to France and show them our lifestyle!” Sara D, 1°S3. « It was my first trip to the United States and I was so glad to discover this country by living there like an American girl. I went to school with my exchange partner everyday, and I did everything with her at the weekends or after school. It was so much fun to discover her friends and her daily life because our lives are so different! » Hortense C, Tle L/ES. 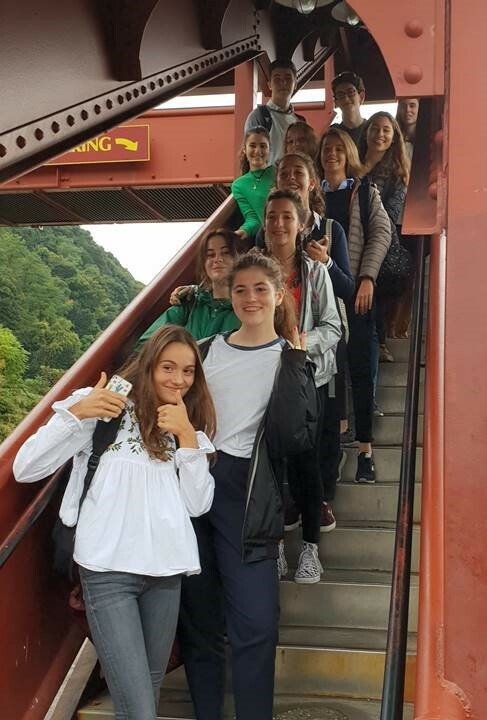 “This trip was so magical that I am sad not to have stayed a little longer!” Enora D, 1°S2. « My partner is my twin sister. We look like the same, we have the same personality, the same tastes and hobbies.. So it was perfect. Elise’s parents (my partner) knew how to make me feel happy everyday. They knew how to listen to me. I thank them for sharing their daily life with me. And I can’t wait March to see Elise again ! » Clara R, 1°S2. “The experience I liked most was the relationship I built with my hosting family. Thanks to them, I could do more things than what I thought: going to restaurants, visiting museums and other places in Pittsburgh, such as an observatory under a starry sky, or “the Point”. 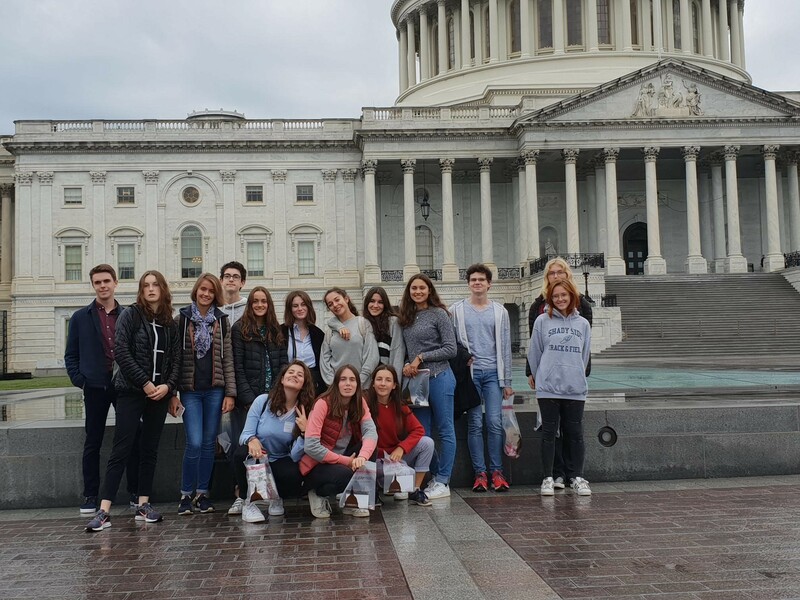 I shared so funny moments with them, such as playing board and video games with all the family, and of course, given the chance to travel to New York city, the Big Apple!” Naïlys BARON, 1°S3. “I was able to taste the American cuisine and discover new flavors such as the Mexican Chipotle. By the way, my host family being Hindu I could also live through the tradition. Indeed, I ate typical dishes (sometimes very spicy ones), for them the month of October being the month dedicated to their God, I was able to participate in their celebrations which consisted in having a meal together with other families and dancing around blessed flowers at a temple representing God. In addition to the American culture, I discovered part of the Hindu culture, which allowed me to realize that there was an important Hindu community in America.”Cléa C, 1°S1. « They introduced me to many things, especially food, but also special things of the American culture such as their openness towards other people.This trip did not make me work my English; it made me talk with new American friends in English. It’s totally different to me because it comes naturally, without even noticing it. I also liked visiting things and see symbols of the American power. It was a direct dive into the country’s History, also showing its importance for the Americans, who are so proud of their young country. I think what I will earn from this trip is mostly a wonderful friendship, that I hope, will survive both distance and time difference. All the benefices I could get in English, I would get them from that friendship, and this is truly what matters to me the most. Not knowledge, not stones, not books or History. People are what truly matters to me. Memories with my host family will stay etched on my memory. » Marie A, Tle S1. Match retour de cette rencontre amicale du 22 mars au 5 avril 2019, avec la visite de nos amis américains, l’occasion pour tous les lycéens d’échanger avec eux et de découvrir leur riche culture. Nous comptons sur vous tous pour leur réserver le meilleur accueil tivolien ! 9° édition de l’échange organisée par Karin Colinet et Alexandra Piette.